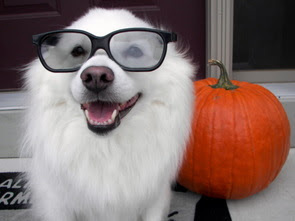 We hope you have a safe and sound night tonight - be sure to enjoy a treat or two (and maybe a trick! ), I know we will! This is our first Halloween in this neighborhood and boy were we surprised with how many knocks on the door we got! Last year in Maryland we lived in the country, so we only had a few people - thankfully we had just enough treats and didn't run out! All of the kids were very nice and courteous - over the past few Halloweens, we would rarely even get a thank you! Since I figured we would be busy handing out treats, I wanted to make a dish for dinner that I could get started ahead of time while not having to worry about answering the door. 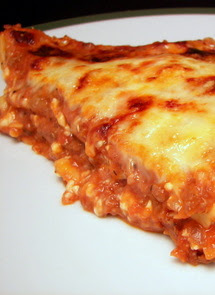 I thought this Healthier Meat Lasagna, with it's blood red sauce, would be an appropriate meal to have on Halloween! This recipe has a couple tricks of its own for a twist on your everyday lasagna - while it does use regular whole wheat lasagna noodles, they are first broken in half so they will easily fit in the smaller 8" x 8" baking dish. Instead of boiling the noodles, they are simply soaked in hot tap water until they soften - I didn't know if this was going to turn them gummy or make them hard to work with, but surprisingly enough they were easier to work with I thought! To add some nutrition and bulk up the meat sauce, the recipe sneaks in chunks of eggplant before adding the lean ground sirloin. This gives the vegetable time to soften and break up, so by the time tomato sauce has been added, you really have no idea that there is eggplant hiding inside. Taking the place of ricotta is a hearty dose of cottage cheese - the small white curds are simply flavored with sharp Parmesan, salt and pepper. The layering process went well and filled up the dish just enough - the lasagna is topped off with a scattering of more Parmesan and shredded mozzarella cheese for that golden cheesy crust on top. Just like any other lasagna, you will want to wait at least 10 minutes or so to give the lasagna a chance to begin to set up. If you cut into it right away, you risk the noodles sliding all over the place and making a mess - however, it would be a delicious mess! I cut into it at the 10 minute mark and probably could have waited another 5 or 10, but we were hungry and wanted to start eating before another knock on the door came! Since we are used to using whole wheat pasta, I couldn't say if it was really a noticeable difference from white pasta, but I think between the generous thick meaty sauce and cheeses, any wheat-y flavor it may have would probably not stand out. Of course I waited until Jeff's plate was almost licked clean to ask, with my evil grin stretched across my face, how he liked his piece... I first got a heavy sigh, followed by "ugh, don't even tell me, I don't want to know!" Two minutes later, curiosity got the best of him and I had to divulge the news - he was pretty surprised and said he had no idea! Eggplant added to the good list - check! I wonder what will be the next food to tackle? It is time again for another edition of the Weekly Wednesday Treat Day report - how lucky are we that this Wednesday just happens to fall on Halloween?! Of course we had to do something fun and a little creepy for the co-workers, so Jeff will be bringing a basket of these Butterfinger Eyeballs tomorrow. 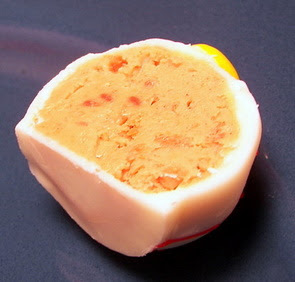 If you remember when we talked about the Buckeyes awhile ago, you will already have an idea about what is inside. 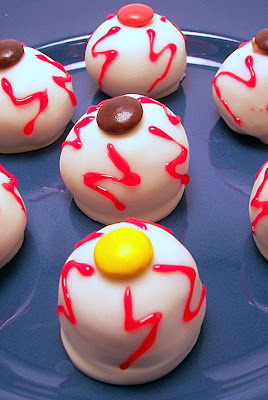 Fairly similar with the base of them being butter, confectioners' sugar and creamy peanut butter, these eyeballs are studded with an extra special treat of chopped up Butterfinger candy bars! The balls come together in a snap - when you add the confectioners' sugar, the dough will be fairly dry, but keep mixing as it will slowly absorb into the peanut butter and you will be left with a non-sticky dough that holds together well and is easy to roll into balls. I used a tablespoon cookie scoop to scoop out the dough, but only filled it about three-quarters full - this way I could crank them out and they would all be about 1" in diameter. The dough is a little soft after rolling, so to help facilitate coating them in white chocolate, they are first placed in the freezer until they are firm. Because you're working with pretty cold dough while dipping in the chocolate, it would be a little tough to keep tempered chocolate in check and at the right temperature throughout the process. This method uses a little shortening when you melt the chocolate to keep it smooth and fluid. 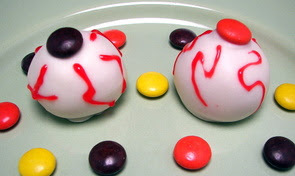 After you dip a couple balls in the chocolate, you form the "pupil" of the eyeball where the toothpick was - to do this, press a candy or whatever your heart desires into the spot before the chocolate has set. We decided to just use Reese's pieces. 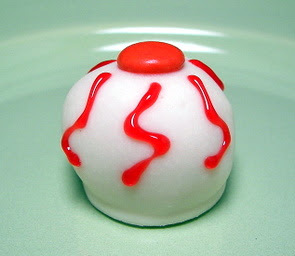 For the bloodshot effect, use a tube of red decorating gel to make the lines around the candy pupils. Peanut butter lovers beware - these treats are highly addictive with their rich, soft and intensely peanut flavored centers. The chopped Butterfingers inside added extra pizazz to take these to a new level - I am so using this trick next time I make the other buckeye recipe! While we were finishing up the eyeballs tonight, I tossed a few sweet potatoes that I rubbed with olive oil, salt and pepper into the oven to bake. 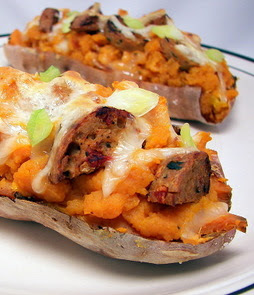 I needed them to have enough time to cook and cool down so we could make these Twice-Baked Sweet Potatoes for dinner. While the potatoes were cooling, we sautéed a few links of chorizo that were sliced into half-moons until they were crisp. The potatoes were finally cool enough to handle at this point, so we set the chorizo aside and scooped out the flesh from the potatoes - we left just enough around the sides and bottom to support the shell. In the same pan we cooked the meat in, we warmed up and mashed together the tender sweet potato with broth, butter, pumpkin, honey, garlic, a chipotle pepper with some of the adobo sauce it was packed in, bright orange zest, fresh squeezed orange juice and grated nutmeg. We then mounded the orange-tinted mixture into the potato skins and scattered the tops with the crispy chorizo and a scattering of smoked cheddar cheese. The potatoes then go under the broiler just long enough to melt the cheese - they are finished with a sprinkling of thinly sliced green onions. 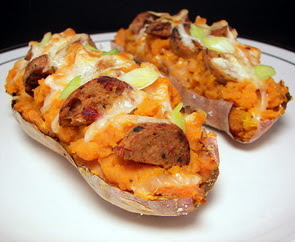 These filling potato boats had a smooth mildly-sweet filling, yet it was well balanced by the savory and smoky heat from the chipotle in adobo. I loved the idea of tossing the mashed pumpkin in with the sweet potatoes to bulk up the mixture - while I don't think you could pick out the pumpkin flavor-wise, we did think it helped with the creamy texture of the mashed filling. I was happily surprised that the pungency of the orange broke through the potato flavor, yet it was not overwhelming in the least - the clean sweetness helped to cut through the heavier chunks of chorizo on top. The smoky cheese was a nice touch, but I think you could get away with using your favorite cheddar on top if you don't feel like splurging. Hmm, have you ever started the finishing touches to whatever you may be making and then wished you could flash back 5 minutes and stop yourself? 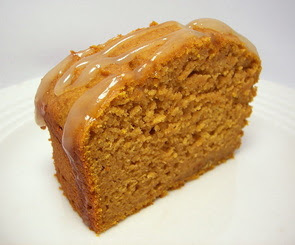 That happened to me today when I was trying to finish this Pumpkin Pound Cake with Buttermilk Glaze. I was quite happy how the cake looked when it was done and proceeded with the recipe to make the glaze to drizzle over the top. I've never made a cooked glaze quite like this one, but it sounded like the flavor would tie in well with the recipe. This glaze is a mixture of buttermilk, granulated sugar and a couple pats of butter that are combined with cornstarch and cooked until it had thickened. This part was no problem - it came together well and it tasted great - however, it had this weird cloudy appearance and the texture was kind of like melted jelly. It looked like it would pour okay, but as soon as it hit the cake it just looked so odd - not milky-white like one would expect a glaze to be. Oh well, since it was just for us I went ahead and finished glazing as it did taste good! The cake itself is pretty dense as one might expect with a pound cake, but it was not too heavy - the mashed pumpkin is drained over a couple layers of paper towels to help achieve a light texture. I fussed with the spices; rather than using a prepared pumpkin pie spice as called for, I tossed together a combination of cinnamon, cardamom, ginger, fresh grated nutmeg and clove. This made for quite the fragrant aroma as the cake baked - Jeff and I both commented on how well we enjoyed the alluring depth the cardamom added. The buttermilk in both the cake and glaze did bring a nice twang to the background - maybe just using a simple confectioners' sugar glaze to make it a little more appealing next time. When we were about halfway through our pieces and almost at the same time, we both said "it's just like pumpkin pie, but it cake form!". We're still working on our apple supply and I've been keeping my eye out for savory recipes that we could enjoy their flavor in. I'm glad I came across a recipe for Muenster, Turkey and Apple Quesadillas as it really hit the spot tonight. 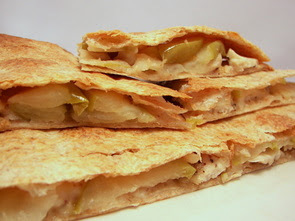 In between two flour tortillas (I used a honey wheat flavored tortilla), layers of semi-soft shredded Muenster, chopped cooked turkey and thinly sliced granny smith apple are given a sweet and savory boost with a few dribbles of honey mixed with sharp Dijon mustard. Usually we just cook quesadillas in a skillet, but this time we did them in the oven - we preheated the baking sheets while we were assembling the quesadillas so the bottom tortillas could get a head start on getting crispy. This method also allowed us to do several at once (for leftovers to re-toast tomorrow at lunch! ), rather than one or two on top of the stove. Our Muenster was aged a bit giving us a more robust contrast, but if you've never used it before, you may want to opt for the non-aged for a more mild cheese. The apples had just enough time to soften, yet not so long they turned to mush - it was a pleasant contrast to the crunchy toasted tortillas. 12 new recipes this week - although, I did make another one that was a repeat - I'll talk about in a minute. Sorting through the new ones we made, I think our favorites this round were Brown-Sugar Glazed Carrots, Mocha Toffee Crescents and the Milk Chocolate Gingersnap Cookies. Now, back to that repeat recipe! Apparently some of his co-workers had been browsing through the blog and asked him if we ever do repeats a couple weeks ago. Jeff found out which one they were wondering about, but also let them know we rarely do repeat recipes - the one in question was a bar cookie we made way back in January of '06! 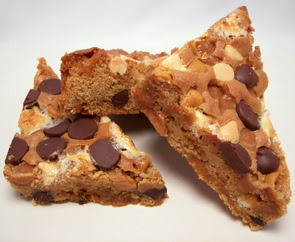 After he told me about this, I tried to figure out when I would have some extra time on my hands - so last Wednesday, I threw together a batch of those infamous Rocky Ledge Bars that are quite rich and studded with goodies. The only thing I did different this time with the recipe was to toss in those new caramel bits instead of chopping up the cubes. Man... we have to re-think this lack of repeats because these were so darn good! He brought them in on Thursday as an extra-special bonus treat day - nary a crumb came home, so I think they were thoroughly enjoyed. I hope so anyway! I have to say... we are completely stuffed from tonight's dinner! 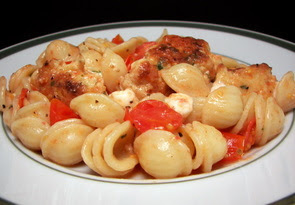 We had this very hearty Pasta with Turkey Meatballs and Bocconcini dish that we could not stop eating. Be prepared for a bit of prep time as you need to roll out about 24 smallish meatballs - I used a tablespoon cookie scoop to help speed up the process though. The turkey balls are simply flavored with minced garlic, Parmesan cheese and fresh parsley - I was going to add some dried herbs to the mix, but I cooked up a tiny one to check for seasonings and liked how it came out. While they begin to brown in melted butter, you will want to get your pot of water boiling to cook the tiny ear-shaped pasta called orecchiette. This shape may be a little hard to find, so you could use any other short pasta if needed. When the meatballs have browned all over, a bit of water is poured in to help them cook through - the water will also loosen up any of the flavorful bits stuck on the pan to create the sauce that moistens the pasta. Once the infused water has been reduced and the meatballs are done, halved grape tomatoes are tossed in to soften and release their juices, helping to flavor the liquid. Now, here is where the magic happens - the pasta is drained and added back into the warm pot - the meatballs and juices are added, along with butter, parsley, a bit more Parmesan cheese and those bite-sized squishy balls of mozzarella called bocconcini are stirred in. The heat from the pot and pasta is just enough to soften the mozzarella, yet the balls still retain most of their shape instead of dissolving into the mix. I'm not sure it could get any better than this - so good! Jeff and I had been talking recently about making a treat to send out to his former co-workers back in Maryland. 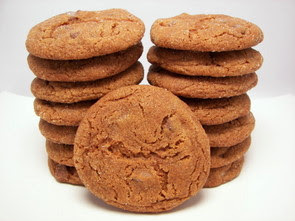 I had some free time earlier in the week and was itchin' to bake some cookies in the kitchen, so I made a batch of these Milk Chocolate Gingersnap Cookies. I made these as I needed something sturdy enough to ship and one where the flavors would only get better over time. 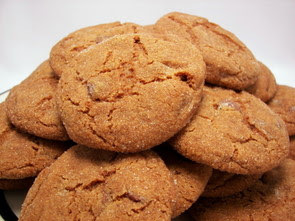 The dough for these cookies is a little different that those Swedish Gingersnaps that we fell in love with a couple months ago - this batch has a bit less molasses, but uses rich brown sugar instead of granulated. The dough is also a bit softer as I used less flour, but I was still able to handle it without the dough sticking to my hands as I rolled it into balls. The cookies had a hard chew to them, but they were not dry or crumbly - their crispness was accentuated by the sparkling granulated sugar the balls are rolled in before baking. I usually prefer a darker bittersweet chocolate in cookies, but I'm glad we tossed in the milk chocolate chunks as the creamy sweetness was a welcome contrast to the snappy spices. I did test a couple before baking - we flattened a couple and left two alone to see what they would do as they baked. We thought they spread just enough to cook evenly and have a nice shape without having to flatten the dough balls - I couldn't tell much difference in the end, I think the flattened ones were just a tiny bit thinner. I liked how they kept a decent thickness so the cookies felt substantial enough as you ate them. Woo! 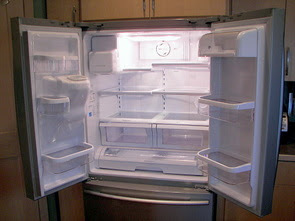 It's new fridge time again! We had quite an exciting day around here today... First, we spent most of our morning at the DMV - apparently if you leave the state and move back and it has been more than a year since your Minnesota license has expired, you have to re-take the written test! For as many times as we have moved, we've never had to do this in any other state. I don't know why, but we were pretty nervous and I swear I was going to fail because of it. Thankfully, we both passed with flying colors - I don't remember there being 37 questions when I took the test ages ago either! 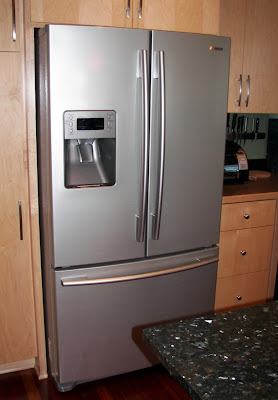 If you remember, it was just a year plus a couple months ago that we got our new LG French door refrigerator when we were living out in Maryland. Sadly, we had to leave it behind when we moved and the new house in Minnesota came with a smallish side by side. Even though there are just two of us here, it seemed like it was constantly stuffed full and we had no room in it at all! We decided to head out on a whim and check out what was on the market now and came across a new Samsung French door at Lowes. It had some of the similar features that we liked in the LG, except this one had water and crushed(!!!) ice in the door. We have seen other models that had ice in the door, but they didn't offer crushed. After getting a killer deal and having a 10% off coupon, we just couldn't pass it up and got one! We had it delivered today and I can't wait to have a ton of extra room again. Just in time for our upcoming Christmas baking spree! 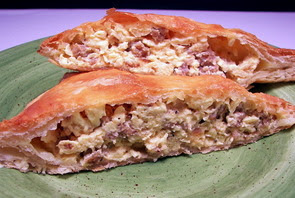 We took it easy this evening and had a breakfast-for-dinner night with these simple, yet decadent Sausage, Egg and Cheese Turnovers. I know I'm behind the times... while we've worked with phyllo dough in the past, I've never actually used puff pastry before! This buttery dough was so easy to work with and I'm sure it will pop up now and again after using it tonight. After a handful of chopped mild red onions are softened in a dab of butter, hot Italian turkey sausage is added in to crumble and brown. Once the spicy sausage is cooked, a mixture of eggs and egg whites is poured in and stirred to scramble the mixture - don't take this too far, you want the eggs to have cooked enough to have formed curds, but you want them to be still somewhat wet when you take it off the heat. They will continue to cook as they need to cool down and they will also cook a bit more once they are stuffed into the pastry. Before letting the scrambled egg and sausage combination cool down, a few chunks of softened cream cheese are stirred in to add a rich luscious texture. The original recipe has you divide the pastry into 4 sections, but we thought that was a bit much and divided it out into 6 instead. The cooled eggs are piled into the portions of pastry and sealed inside with a fork - once moved to the baking sheet, they are painted with an egg wash to help them achieve a lovely golden color as they bake. 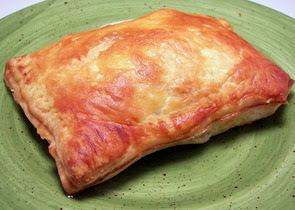 The flaky pastry puffs up and grows in size, so be sure to give them enough room on the baking sheet to expand. Such simple pleasures as diving through the crisp crust to expose the hidden creamy egg filling should be experienced more often in life - I know I can't wait to do it again tomorrow morning for breakfast! Jeff went to pull out the treats for the pups yesterday once they did their business outside and I heard an "uh oh" that he muddled under his breath. I knew at that point I was going to hear whining from the doggies all the time until I got something together for them - are they spoiled or what? Yes, we even try to keep their treats new and different (although they could probably care less as long as they get it when they want it! ), so today I got these Cinnamon-Rye Snaps baked for them. I tossed together a variety of dry ingredients for these treats - I used whole wheat, all-purpose and rye flour that I mixed with wheat bran, wheat germ and a dash of cinnamon. 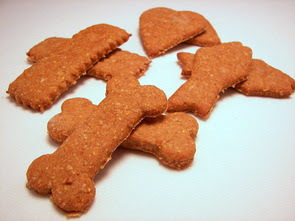 To help them crisp up and tempt their doggie palates, a few tablespoons of molasses make up part of the liquid ingredients that moisten the dough. When you combine all of the ingredients, the dough may still be a little sticky and lumpy - treat this kind of like a bread dough, scoop it out onto a lightly floured surface and knead it just until it becomes smooth. It won't take nearly as long as bread dough though, you just want everything completely mixed - you will probably need to add a little bit of flour to keep it from sticking while you work with it. I do think I need to get some new cookie cutters for the sake of variety - I have a good selection of large cutters, but not many of the small kind that would be a good size for them. It may be kind of tough to tell when they have taken on enough color, but they should be fairly firm when they are ready - just remember they will continue to crisp as they cool. Spike even let out a couple excited yelps (this coming from the dog that rarely makes a sound, other than snoring...) after devouring his first one this afternoon, so this one will certainly be filed away to make again. Sloppy joes are something my Mom made fairly often, but I don't ever remember eating them - I was so picky when I was younger that if I couldn't spot exactly what was in it, I would probably not be eating it. Weird to think about now with the types of food we quite enjoy these days! 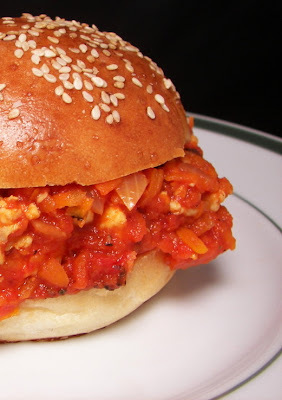 Tonight we made this hearty comfort food dish, however, the recipe for these Turkey Sloppy Joes added or swapped out a few ingredients to make it a bit lighter than the traditional version. A couple cups of shredded carrots bulk up the dish allowing you to use a little less meat without the mixture looking too lean. By the time the carrots have softened and you add the crushed tomatoes, I really don't think you would even know they were ever there - Jeff was quite surprised when I asked him how the carrots tasted! He just looked at me with a puzzled face and said "Huh? I didn't get any carrots on my plate!". Good sign I think as he picks through everything to see what I tried to put in his food now. I didn't know if the couple tablespoons of dark-brown sugar would make this sandwich too sweet, but we quite liked the rich depth it gave to the sauce - it also did a good job of hiding any tinned flavors the tomatoes might give. The finished dish was saucy enough for us, but not so much that it wouldn't sit nicely on our favorite homemade hamburger buns. Don't get me wrong though, have a napkin handy as the name does not lie... these are sloppy to eat! 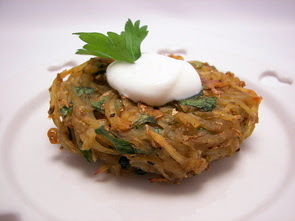 Kasha and Spaghetti Squash - two more additions to the acceptable food list! We've tried quite a lot of new-to-us whole grain ingredients since starting the blog - bulgur, quinoa, millet and barley just to name a few. This Multigrain Pilaf we had as a side tonight incorporated a couple that we have had before, but introduced us to one we have never tried - Kasha. From my understanding, Kasha is basically buckwheat groats that have been roasted to bring out their natural sweet and nutty flavor - this process also removes some of bitterness found in the grain. The pilaf starts its base flavor by softening a chopped onion and a few cloves of garlic in olive oil. Vegetable broth, along with the kasha, pearl barley, bulgur and a bay leaf are added into the pot and brought to a boil. The mixture is then cooked similar to rice - simmered and covered until the liquid has been absorbed, just a quick 15 minutes. I checked mine and the grains were tender enough at 15 minutes, however I still had a good quarter cup or so of liquid remaining that I just ended up straining away. 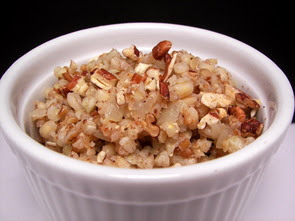 The pilaf is rounded out with a scattering of toasted crunchy pecans to serve. I loved the textures in this pilaf - the grains had softened, but retained a satisfying chewiness with a mild "wheat-y" flavor. 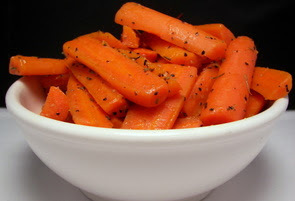 This is definitely a good choice if you are looking for a higher fiber side dish. If you remember, we tried out Acorn squash for the first time last week - I mentioned that since we enjoyed it so much I scoured the bottom of my to try piles (where a lot of the "iffy" recipes end up) and pulled out another squash recipe to serve this week. 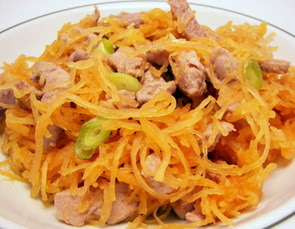 We opted to go with a recipe for a Spaghetti Squash and Pork Stir-Fry as we've never had this type of squash before either! It was quite fun to watch when I pulled the Spaghetti squash out and used a fork to shred it into thin brilliant orange strands! The squash does take some time in the oven to get tender enough, but you could bake it off a day or two ahead of time and just keep the strands in the refrigerator. The pork used in this dish is pork tenderloin - it is first cut into rounds and then each piece is cut into matchsticks for speedy cooking. Scallions, garlic, ginger and pork are cooked in a bit of toasted sesame oil to give the mixture a sesame punch. Once the squash threads are tossed into the pan, a combination of soy sauce, rice vinegar and sriracha quickly follow to bring a hot salty note. One of the reasons I think we liked this so much is because we were surprised how well the squash held up and didn't turn mushy at all. If you bake the squash ahead of time, you could easily get this dish on the table is probably less than 15 minutes - great for those busy weeknights when you might not have a ton of prep time just to get dinner started. Jeff delved back into that Holiday magazine again to pick out what he wanted me to make for the Weekly Wednesday Treat Day we do for his co-workers. This is the fourth item we've made and so far each one, including today's treat, has been a real winner! If you've been reading our site for awhile, you have probably picked up on the fact that we love the combination of sweet with a dash of heat. 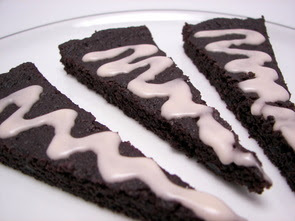 While these Fudgy Ginger Shortbread wedges are not necessary "hot", they do have a mild spicy bite from tiny cubes of crystallized ginger strewn throughout the cookie. The cookies have a moist, delicate and crumbly quality to them, yet they are still firm enough so you can easily pick them up off a plate without falling apart. Dutch-process cocoa gave these buttery wedges a smooth chocolate depth - however, since there is no leavening to fuss with in the recipe, feel free to use a natural cocoa powder - especially if you like the slight bitterness it has. 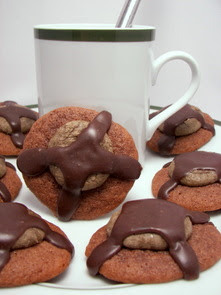 This cocoa powder also turned the cookies a very dark color which set off the light drizzle on top. When the cookies are done, let them cool in the pan for 10 minutes to finish setting up - after that amount of time has passed, they will be firm enough to lift out as the pans are lined with foil for easy removal. This is done so you can easily divide the rounds into wedges while they are still warm - it allows to you get clean cuts without much crumbling. 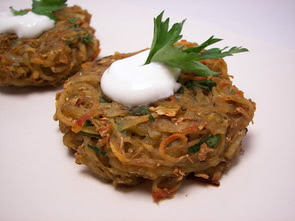 With the help of our food processor, tonight's dinner transformed a few plain russet potatoes into these flavorful little Indian-Spiced Baked Potato Cakes. We first started by toasting mustard and cumin seeds in a little olive oil until they began to pop. The spices along with a dose of salt are then pounded in a mortar until they are well smashed. If you don't have a food processor, you could certainly shred the potatoes on a hand grater, but it may take awhile as you need 4 1/2 cups. The potatoes will probably be a little wet once you are done, so be sure to squeeze them to remove most of the excess liquid - I patted them with a few paper towels to help the process along. The shreds are tossed with the toasted spices, fresh parsley, canola oil, turmeric and a pinch of cayenne pepper. To keep the cakes fairly even in size, they are portioned out by using a 1/3 cup measuring utensil - they are a little thick at this point, so gently press them down until they are about 1/2" thick. You don't want them too thick or they may not have enough time to cook all the way through. The cakes bake the majority of the time on one side, but they held together quite well when we flipped them over to get some color on the other side. To calm down the spices some, each cake is given a dollop of cool sour cream before serving. Jeff and I both liked these, but I think we may have packed the potatoes in the measuring cup a bit too much. While the insides were cooked and the outside had a nice golden crust, I thought the texture was a little on the gummy side. They were either packed too lightly or I didn't get enough of the excess liquid out I think - great flavor though! Oops... a few too many carrots in the fridge! I picked up a 2 pound bag of carrots yesterday at the market as I could have sworn we were out... when I went to put them away, I found a full sneaky bag hiding behind some lettuce! We each have some as a snack with some sort of dip throughout the week, but I thought I should get the older bag used up a little quicker. I didn't have a side picked out for tonight's dinner and while I probably would have served a simple green salad, I went ahead and made these Brown-Sugar Glazed Carrots. It uses a massive 1 1/4 pounds of carrots, so that right there would eat up a good chunk of the bag! If your carrots are especially thick, you may want to cut them in half or even quarter them so they can all cook in roughly the same amount of time. The carrots are cooked in a bit of water with a nob of butter, just a tablespoon of brown sugar and they get a slight floral boost from a pinch of rosemary. By the time the carrots are close to being tender, most of the water should be gone - you want to let it keep reducing down until it makes a light glaze that coats the carrots. If for some reason you run out of water before the carrots are tender enough, go ahead and pour in just a little extra water to allow them to finish cooking. The slightly sweet carrot chunks were tender enough to easily bite into them, yet were not mushy in the least. With just a couple minutes of prep time, this recipe is easy enough to throw together for a delicious, quick and healthy side any day of the week. In our recipe section, one of the least populated categories is probably the seafood section. I've never been a big fan, but over the last couple of years we have slowly(!) been trying to add more into our diet. While we do try to branch out and try different varieties of seafood, we usually stay in the safe zone and use an ingredient we know we like - just like in tonight's main dish of Spicy Shrimp and Fettuccine. As you wait for the strands of fettuccine to cook, a mess of minced garlic and a couple shakes of crushed red pepper are infused into some olive oil in a large skillet. 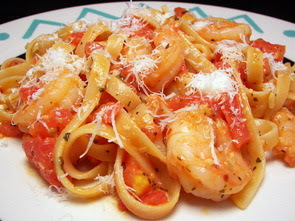 When the aroma of the garlic becomes intense, peeled shrimp are tossed in and briefly sautéed before the addition of chopped tomatoes, sour cream, tomato paste and basil. By the time this mixture has thoroughly heated through, the pasta should be about ready and is tossed in to finish cooking for a minute or two in the fiery sauce. Once plated, a scattering of Parmesan cheese completes the dish for a slightly sharp bite. We had everything in the pantry already for this dish except for the tomatoes - I went ahead and got a couple this weekend, but I think you could just use a semi-drained can of diced tomatoes (fire-roasted would be good!) to simplify things. If you enjoy extra spicy food, up the crushed red pepper to 3/4 or to a full teaspoon if you're feeling especially frisky. Bumping up the totals a bit this week with 13 new recipes - narrowing down favorites was a little tough, but I suppose we would choose the Acorn Squash with Brown Rice and Turkey Sausage, Chunky Spiced Applesauce and the Grilled Apples with Cheese and Honey. You could also be somewhat cruel and decide that your pup would like to strut around the neighborhood with them on! I guess we should jump back into the food as that's why you are probably here! Since I try not to waste leftover ingredients (it doesn't always work out this well! 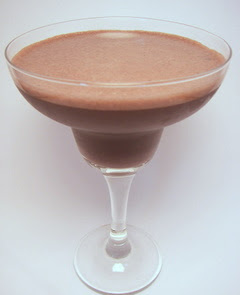 ), I had just enough of that silken tofu we used in the tomato bisque leftover to make a couple filling Banana-Cocoa Soy Smoothies for us this afternoon. I kept the leftover tofu covered with filtered water in the refrigerator - I think it stays well for at least a couple days (probably longer?) as long as you change the water. To give some body to the smoothie, the bananas are first sliced and frozen - this works well in most drinks using fruit so you don't end up watering down the flavor with ice cubes. I only left them in the freezer for about 45 minutes and they were fairly solid by then. The leftover silken tofu, some soymilk, cocoa powder and a few squirts of honey are first whizzed together until completely combined. The frozen bananas are then dropped in and you let 'er rip until the mixture is smooth. Seriously, banana, chocolate and honey - what's not to like? Since Jeff is intent on us making the entire index of that Holiday cookie magazine, I asked him which recipe he would like us to make just for us. After looking at it for what seemed like an hour, he finally settled on these Mocha Toffee Crescents. While these cookies are quite uncomplicated, they have that sophisticated melt-in-your-mouth buttery quality to them with a slight hint of coffee lingering around after each bite. 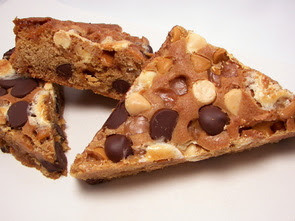 The dough for the cookie is studded with crunchy toffee bits - I thought the bits may be a little obtrusive to the smooth cookie, but they melted into the cookies and left a caramel-esque bite that played well with espresso powder. The dough was a little soft and a touch tacky, but I could easily roll and shape them without them falling apart. You want to bake these until they are firm and set, but be sure to remove them before they take on any color to keep them from drying out. 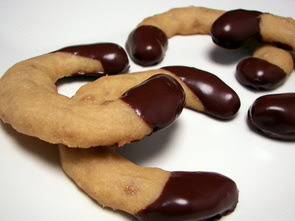 Since the cookies look a little plain on their own, just the ends are dipped in melted bittersweet chocolate for an extra special touch - you could also gently toss them in confectioners' sugar to sweeten up their appearance. When we made our last apple treat from our bushel of apples we picked, I mentioned I had a pie in mind that I wanted to get made. I wanted to wait until the weekend so I had enough time set aside - so today I decided to go ahead and make this Crumb-Topped Apple Pie. The pastry is nothing out of the ordinary; it does include butter and shortening so you get both the richness and flakiness that the each provide. It was pretty easy to work with, just make sure that everything is icy cold when you make it. The original recipe did not call for the dough to be chilled before rolling, but that is something I like to do to let the dough relax and firm the butter back up. I used a combination of tart Granny Smith and sweet/tart Fireside apples - they are thinly sliced and tossed with just a bit of granulated sugar to sweeten, flour to thicken and spiced with cinnamon and nutmeg. I used about 5 1/2 cups, but I don't think that was enough as my apples cooked down more than I expected (always happens!) - I would think about using 7 or 7 1/2 cups next time. 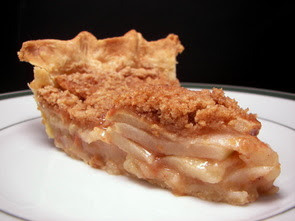 Instead of a top pastry crust, the apples are scattered with a simple crumbly mixture of flour, brown sugar and butter. 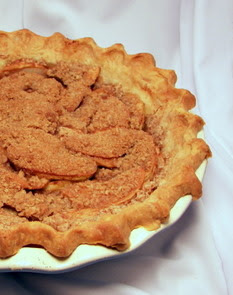 Once fully assembled, the pie starts out in a hot oven to give the bottom crust a blast of heat, but then the temperature is lowered to give the apples plenty of time to cook. When I went to cut the pie, I was happily surprised to see that while it was still juicy, it cut into clean pieces without any of the sweet liquid oozing out. The apples had just enough time to soften, yet still retain their texture so they didn't turn to mush. I thought I would miss the flaky top crust, but we quite enjoyed the buttery crumbles and felt we were able to taste more of the apple's flavor. Mornings during the weekday can be a little crazy around here - trying to take care of the pups (Spike demands his food bright and early!) and getting breakfast ready for Jeff before he runs out the door for that 45 minute commute into work. Some days he does not have enough time to sit down to eat (someone hits the snooze a few too many times!) so I like to keep the freezer stocked with different items that I can quickly heat up for him to eat on the go. 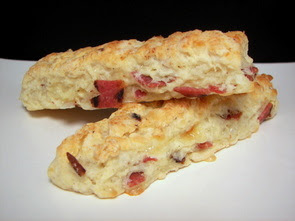 I made a batch of these Cheesy Bacon Sticks just for that purpose today. These are much like a biscuit, except after the dough is patted out into a square, it is cut into long sticks. Inside of these buttery biscuit fingers are crisp pieces of crumbled salty bacon along with little pockets of melted white cheddar. To help offset the bacon and cheese (I know I know...) I used a combination of white whole wheat flour and all-purpose to keep them light while adding in a bit of whole grains. I used plain yogurt to moisten the dry ingredients, which also helps with their tenderness, but you could also use sour cream or a combo of the two if you want a bit more twang. My plan is to just keep them well wrapped in the freezer and use the toaster oven to warm them up - this way I can send a couple along on a napkin and he can easily eat the golden sticks during the drive into work. It has been grey and rainy outside for almost the entire month of October so far - I think we've had maybe one or two days when the sun actually made an appearance for the whole day! It was just the same today, except there was this wicked cold wind outside - I was planning a different recipe for tonight, but decided to make this Creamy Tomato Bisque with Mozzarella Crostini instead as it sounded much more comforting. This recipe had a couple interesting tricks that resulted in a fantastic texture - the first is adding a quarter cup of white rice in with the broth and letting it cook until it is quite tender. The starch from the rice will end up giving this dish a delicate body and thickness as it will be pureed later on. 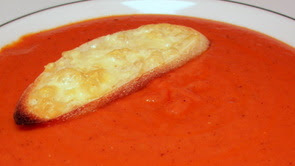 To lighten this rosy bisque, but still give it a luxurious creamy texture, silken tofu is used in place of cream or milk as it easily blends in and allows the tomato flavor to stand out. We used fire-roasted crushed tomatoes to give some depth - however, you could use regular - I thought the smoky flavor was a nice highlight though. I just used our immersion blender to puree the soup in the pot, but feel free to use a blender - just be sure to do it in a couple batches. We both commented that we enjoyed how it was not soupy, yet it was not gloppy or thick either - just viscous enough to float a crisp cheesy baguette on top for a great visual finish. There are times when we are left with just a little bit of this or that from different recipes hanging out in the refrigerator that I don't know what to do with. Usually we end up snacking on them or sometimes they hang out a little too long and we end up tossing them. We had a couple stalks of celery and a handful of grapes leftover that were almost to that point, so it seemed like it was a good time to toss together this Apple, Grape and Celery Salad. 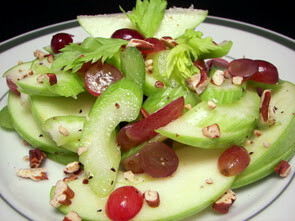 The celery stalks are thinly sliced on the diagonal while the grapes are just sliced in half. To add a tart contrast to the sweet grapes, a juicy Granny Smith apple (woo - another apple off the shelf!) is then thinly sliced as well - try not to go paper thin as you want the salad to have a crisp texture. The mixture is then simply dressed with a splash of white-wine vinegar, a glug of your best extra-virgin olive oil and a sprinkling of salt and fresh ground pepper. Good as is, the salad is given another layer of texture with a scattering of nutty toasted pecans on top. It didn't really sound like much at first when I was glancing over the recipe, but I'm glad we gave this crunchy salad a try anyway! Hitting lots of texture and flavor points, this clean, fresh and colorful salad turned out to be a great healthy way to use up those leftover ingredients we had. Also, if you have some little helpers around that like to join you in the kitchen, this might be a nice recipe to keep them occupied! Tonight's dinner has us trying to branch out again... can you believe we've never had acorn squash? We've both tried butternut squash a couple times and while I liked it, Jeff was less than impressed. 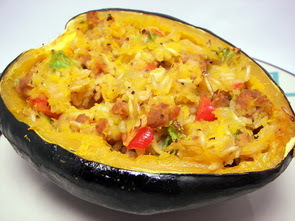 I figured enough time had passed now that he should have probably forgotten about that - I approached him with the idea of making this Acorn Squash with Brown Rice and Turkey Sausage dish and he thought it sounded good, so tonight was the night! To make this go a little quicker, the acorn squash is first zapped in the microwave, after halving and cleaning out the guts, to soften the light-orange flesh inside. While waiting, we cooked and crumbled a couple links of hot Italian turkey sausage until lightly browned. Once they were done, we removed the spicy bits of meat and then sautéed chopped onions, red bell peppers and a garlic clove in the same pan. When the squash has cooled down enough to handle, most of the tender flesh is scooped out, leaving about a 1/4" border around the edges. The meat of the squash is then mixed with the sausage, cooked vegetables, chopped fresh parsley and a couple scoops of cooked brown jasmine rice. The empty acorn halves are then stuffed with the hearty sausage mixture and baked in the oven until completely heated through. Who knew squash could be so good? It really is too bad we waited this long to give it a try! We (Jeff especially!) loved the smooth texture and mildness of the squash - it was a great backdrop to the heat from the Italian sausage chunks and fragrant rice. Serving in the tidy little shells made for a great presentation and a fun way to enjoy the dish! This has me excited to try out other squash recipes I've been moving towards the bottom of the to-try pile for the longest time - I've already got one picked out for next week! So, why not mash the two together? That's exactly what I did to make this Chunky Spiced Applesauce. While the ingredients are not all that unique to create this applesauce, combined they make an explosive party-in-your-mouth atmosphere with each spoonful. Rather than using just one type of apple, I like to use a variety in applesauce - I used Fire Side, Golden Delicious, Pink Lady and also tossed in a Granny Smith. Once they are cored and peeled, the apples sit in some cold water with half of a lemon while you continue with the recipe. The fresh ruby-red cranberries are combined with granulated sugar, pure maple syrup, water, cinnamon and a dash of fresh nutmeg. They are brought to a boil and cooked until their skins pop - the apples are drained from the lemon-flavored water and then added to the cranberries. The two simmer away, covered, until the apples are soft and tender - the cover is then removed and any excess liquids are allowed to cook away , leaving you with a thick and luscious applesauce. 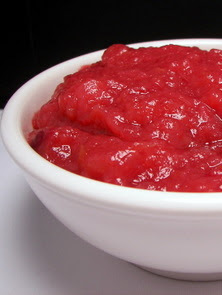 You could puree this glossy applesauce if you enjoy a smooth texture, but we used a potato masher to leave the mixture a little more on the chunky side. 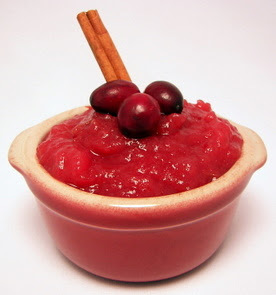 This is not your ordinary mundane looking applesauce - once fully cooked, the tart cranberries had stained the apples with a glorious deep pink color. Sweet with a tart bite and a subtle maple background, I just can't keep my spoon out of the bowl in the refrigerator! Remember how I told you that we often make a big batch of rice on the weekends and store it in the freezer to pull out for quick dinners? 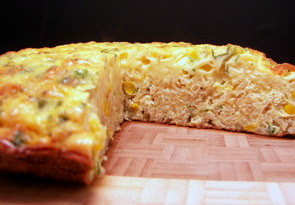 It certainly came in handy tonight when I needed just a couple cups for this Southwestern Rice and Corn Frittata. Frittatas are one of my favorite go-to dishes that don't need a lot of work and most of cooking time is done unattended in the oven. To start us off, a sauté of onions, a jalapeño, garlic clove and corn kernels give us our base flavors. This mixture is then added to a combination of eggs, egg whites, milk, chopped fresh cilantro, cooked brown jasmine rice and a couple handfuls of nutty fontina cheese. This is then placed back in the same skillet that you cooked the onions in (bonus for less clean up!) and cooks on top of the stove until the edges begin to set. The skillet is then slid into the oven and left alone until the center is just set. As it bakes, the rice slowly settles to the bottom forming a kind of crust while the fluffy eggs puff up above it. 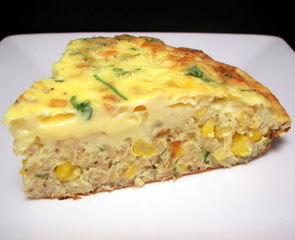 Sometimes these types of dishes can be so light that it takes a few pieces to fill you up, but the addition of the rice and corn made this golden frittata very filling while the lift from the eggs helped keep it from being too heavy. Hot chocolate... but not for drinking! We decided to choose another recipe from that latest Holiday magazine we bought last weekend. Jeff is still adamant that we pick a recipe to make for the Wednesday Treat Day out of this one for awhile! The recipe we chose this week for these Hot Chocolate Cookies sounded way too fun to pass up - bonus points for giving us a chance to try out those chocolate marshmallows we picked up a few weeks ago! What initially caught my eye about this recipe was the inclusion of hot chocolate cocoa mix in the dough. It has not been cold enough that we have really wanted a steaming cup of hot chocolate, so I thought it would be a good way to use up that lonely canister we had in the pantry. The kind I used was a milk chocolate variety. The cookie dough is more like a thick batter, so I would highly suggest using a cookie scoop to easily get the portions onto the baking sheet. 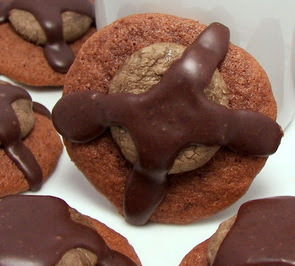 The chocolate cookies are baked until they are just set in the center - they are then taken out and topped with a halved marshmallow in the center of each hot cookie. The cookies then go back into the oven and cook for just a minute or two more until the marshmallow begins to look expand and look puffy. This will soften them just a bit and even out their shape. Now, we have 2 layers of chocolate... but that is not enough of course! 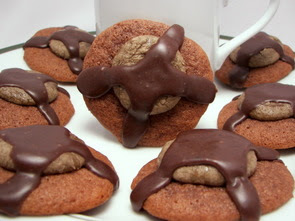 The cookies are taken over the top with a third chocolate layer in the form of a rich glaze. You certainly can't go wrong with all this chocolate! 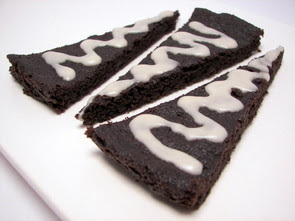 The glaze is kind of like a cooked frosting - you need to work somewhat quickly or it will begin to thicken and set up. However, if you notice that it is starting to get too thick to drizzle nicely, you can add another teaspoon or two of milk as you go along. You can use either natural or Dutch-process cocoa powder in the glaze - I used Dutch-process as I like the smooth rich flavor it has. I was ready for a super-sweet cookie with the milk chocolate cocoa powder and all, but it actually was quite mild with different degrees of chocolate flavor in each bite. As I said earlier, I used the chocolate marshmallows since we already had them on hand, but I would probably use white next time for a more striking contrast of colors - as is, the cookies are just a few shades of brown. I asked Jeff if he wanted anything specific for dinner at all when I was planning out the meals this week and he suggested some sort of burger since we just made our favorite burger buns. Instead of just burger simply seasoned with salt and pepper (which is always perfectly good), we decided to spice things up and make a recipe for Korean Barbecue Burgers. Adding some zip to the ground sirloin is a mixture of green onions, brown sugar, fresh ginger, soy sauce, toasted sesame oil and a couple garlic cloves. When you add this to the meat mixture, try and use a light hand to mix them together - while you do want to completely incorporate the ingredients, you don't want to end up with a tough product. We cooked our burgers to around medium, but I think these would still be juicy enough if you feel more comfortable taking them to well done. 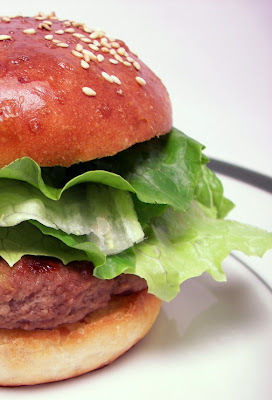 If you want a more snappy bite to the burgers, add some thinly sliced radishes with the crisp romaine lettuce on top of the patties - if you want to stay more authentic or be a little more adventurous, add a generous portion of kimchi instead. Served on our toasted homemade buns, these well-seasoned burgers were just the ticket we were looking for to change up the ordinary burger. Hee hee... maybe I should feel a little guilty about the food I made today, but I don't! We had a little fun fooling Jeff into eating another ingredient he swears he does not like - cottage cheese! The cottage cheese was used twice today and while it killed me to keep quiet, I waited until after he was done eating his dessert to let him in on the secret. When he finished the last bite of these Coconut-Vanilla Cinnamon Rolls, I looked at him with my half-cocked eye brow and slightly evil grin to let him know something was a little different. His first reaction way "Ugh, don't even tell me you put mushrooms in here like you did before!!". No, not quite I said, but as soon as I mentioned cottage cheese, in his best whimpering tone, the only words that came out of his mouth were "but but but, I don't like cottage cheese!". Oh how I wish I had a video camera to capture that moment to show you. 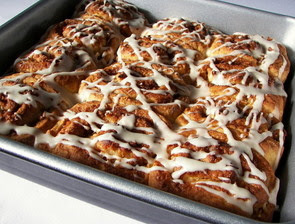 These are not your typical cinnamon rolls - there are no long periods of waiting for dough to rise or lots of kneading to do as these have no yeast in them. I would say the finished rolls are more biscuit-like - they may not be not quite as fluffy or tender as you would get when working with a yeast dough, but they are just as delicious. The dough comes together in a flash as most of the work is done in a food processor. Once made and rolled out, the surface is brushed with melted butter and covered with an aromatic combination of dark brown sugar and cinnamon. To give these a little boost, the layer of sugar is then topped with a scattering of sweetened shredded coconut. 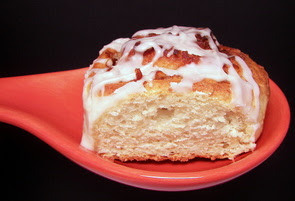 The dough is rolled up just like a cinnamon roll would be and then cut into rounds. I liked using unflavored dental floss to cut the rounds as the dough is a little more delicate and tended to squish down when I first tried to cut it with a knife. They may look a little puny when you put them in the pan, but trust me, they expand up and out when baking just like the regular rolls do to fill in the spaces between them. To thin out the familiar drizzle of icing topping the rolls, we used buttermilk for a little tangy bonus. And much to Jeff's dismay, we found out there was no way you could tell there was cottage cheese hidden away in here - score! We had a breakfast for dinner night this evening and the cottage cheese came into play again with these Cottage Cheese Pancakes. Thankfully Jeff was nowhere near the kitchen or he would have totally discovered the little white curds and blown the whole plan! With the amount of cottage cheese in the recipe, these pancakes are not exactly your light and fluffy variety. They are a bit more heavy; however, this also allowed them to be hearty and pretty filling. 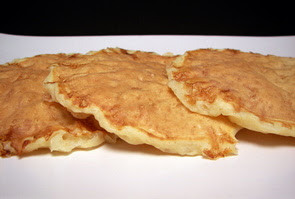 There is only a touch of sugar in the batter, so they are not too sweet either - this makes them an excellent candidate for a good pour of warm pure maple syrup right before eating. You may want to spray your griddle with a cooking spray as the cheese makes them want to stick a little more than normal pancakes. Jeff asked to have the leftovers for breakfast... but that was before the secret was let out - I wonder if he will forget what's in them before tomorrow morning? Woo! We've been busy... we cranked out 12 new recipes this week. Choosing our favorites were a little harder this time, but if we have to choose, they would be the Lemon-Lime Layer Cake, Apricot-and-Cheddar Chicken Melt, Maple-Chili Glazed Pork Medallions and we can not forget about those fantastic Gingerbread Pumpkin Bars. I also finally brought both sections of the recipes to the left up to date - whew, I got a little behind there! I guess it is about time that we start doing something with all those darn apples we picked, besides of course just grabbing them for something quick to munch on. While this only uses one (very large!) 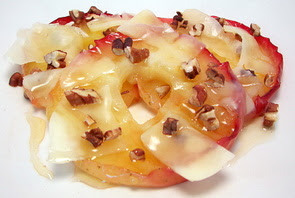 apple, the recipe for Grilled Apples with Cheese and Honey was an excellent way to begin! You can peel your apples if you like, but just like potatoes, we quite like the skin left on. The apples are cut into thick slices and then the core is remove - I used a tiny heart-shaped cookie cutter for something fun and different, but a round cutter works just as well. If it is still warm outside or you are a die-hard grill user, I wouldn't hesitate to fire it up just for these (or leave it on after you have finished grilling your dinner), but we just used our Griddler instead. You could also use a grill pan if you have one handy. Before being slapped on the grill, they are dressed with oil and confectioners' sugar. You want to cook the rings until they are tender, but still retain a slight bite. The warm apples are then topped with thin slices of sharp White Cheddar, a sprinkling of toasted pecans and a drizzle of sweet sticky apple blossom honey. If you want a more pronounced sharpness, you could trade the White Cheddar for an equal amount of Parmigiano-Reggiano cheese - that is my plan when I make this again! The apple blossom honey brought a special note with its mild apple scent, but I imagine this would be well received with whichever variety of honey you have in your pantry. Now, the verdict on tonight's dinner review was a little split... unlike that soup from a few nights ago, I thought these Crab Dogs were fairly good (nothing to write home about though) where Jeff didn't care for them much. The original recipe did call for regular coleslaw, but we used crunchy broccoli slaw as we like texture better. To moisten the slaw, it is coated in a mixture of mayonnaise, fresh lime juice, lime zest, cumin and fresh cilantro. 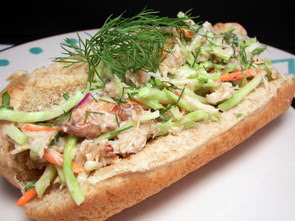 To that, a hefty dose of lump crabmeat is gently folded in and the mixture is stuffed into soft whole wheat hot dog buns. A scattering of feathery chopped dill is the finishing touch to these interesting sandwiches. Since we are not big on seafood (we're trying! I swear! ), I think we are still pretty picky on what we will eat - I thought it was pretty good, albeit a bit on the lime-y side, but Jeff thought the crab was a little too pungent for his tastes. More for me I guess - I won't mind having the leftovers for lunch tomorrow, but I think I will have to throw something else together for Jeff to eat! Not bad, but I probably wouldn't jump to make it again. Almonds and lemons... a sweet combination! Road trip to pick some apples!